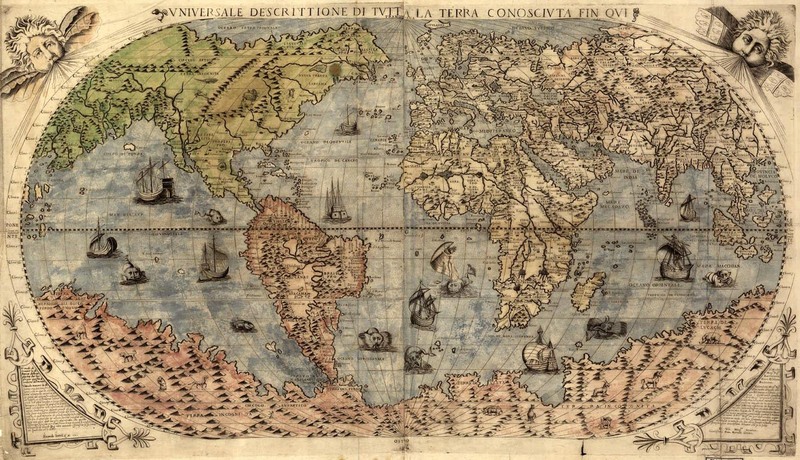 Statistics in Social Science–Fad or Research Frontier? Over the weekend a NYT op-ed on “physics envy” in the social sciences made the rounds. * At the same time, a blog post (also at NYT) from January about the rapid expansion of statistical techniques made the rounds (via @brendannyhan). I find this interesting because the first is criticizing empirical models, while the latter is singing their praises. These two pieces do not necessarily present a fundamental contradiction, since the second (earlier) piece does not have social science exclusively or primarily in view. However, it is worthwhile to spend a bit of time trying to reconcile these two perspectives–the critique of statistical social science on the one hand, and the surging popularity of statistics more generally. The simplest possibility is that physics envy is driving the popularity of statistical social science. This seems improbable for two reasons, though. First, social scientists have been “teching up” for quite a while, employing more and more advanced models over the past twenty years. ** Second, the current hype (not intended derisively) around statistics is much broader than the social sciences, including such fields as biology and finance in addition to economics, political science, and the like. A second possibility is that the hype is driven by results: businesses are investing in analytics because understanding customer/market data is useful. There is some risk that the current popularity of statistics may drive a bubble, resulting in the application of sophisticated techniques even when the juice is not worth the squeeze. But right now there is probably much low-hanging fruit to be had simply by analyzing data that companies already have or could easily obtain. One objection that could be raised to this is that we have not seen dramatic, conclusive discoveries in empirical social science–for every published statistical finding, there is approximately one opposite finding, sometimes using the same statistical method or the same data. I personally do not endorse this criticism wholeheartedly, but it is sufficient to reject the second explanation as a reconciliation of the two viewpoints with which we began. The third alternative is that social scientists (and others) see promise in the results of contemporary empirical work, not just satisfactory answers in extant results. The “physics envy” piece fails to recognize the exciting developments at the frontiers of statistical science and computational social science. Methods such as ensemble Bayesian model averaging or computationally-aided mechanism design are serious attempts to account for the complexity of social behavior. Ignoring these developments in order to rehash an old, tired argument is counterproductive. *Erik Voeten comments on it at TMC, but I’m waiting until after this post to read his thoughts. **As should become clear later in the post, this refers to the frontier of the discipline(s), not the general level of statistical acuity. Continuing the theme of ethical statistics from the previous two posts, I would be remiss if I did not mention one of the best books on the subject: The Mismeasure of Man, by Stephen Jay Gould. In the book, Gould aptly discusses flaws with measures of intelligence that have been used to justify social hierarchies such as racism and eugenics on a supposedly “scientific” basis. He spends about half of the book on craniometry–the measure of skulls–but gets to IQ in chapter five. A brief summary of that chapter, and some further reading on IQ and economic success, will illuminate our ongoing discussion. The book is packed with interesting anecdotes of how scientific research is actually done in practice, and how researchers can unconsciously fall prey to their own biases. One such account concerns a project by Catherine M. Cox to analyze the IQ of great historic figures using their biographies. The project was chock full of methodological problems, the foremost of which was the availability data. A second problem was bias in the arithmetic: Cox had her five scorers start at a base IQ of 100 and add points as they were motivated by accounts of the subjects’ precocity. As a result, there were no scores below 100 and all of the scores basically reflected the amount of available information about the individual. Cox “measured” IQ at two time points: childhood (A1) and as young adults (A2). The result? What does this have to do with politics? It seems that IQ is still popping up as an explanatory variable, even in cross-national research. (Gould adeptly describes the problem with using measures on individuals as the basis for between-group comparisons, but that is beyond the scope of the current post.) Take a look at the figure below. 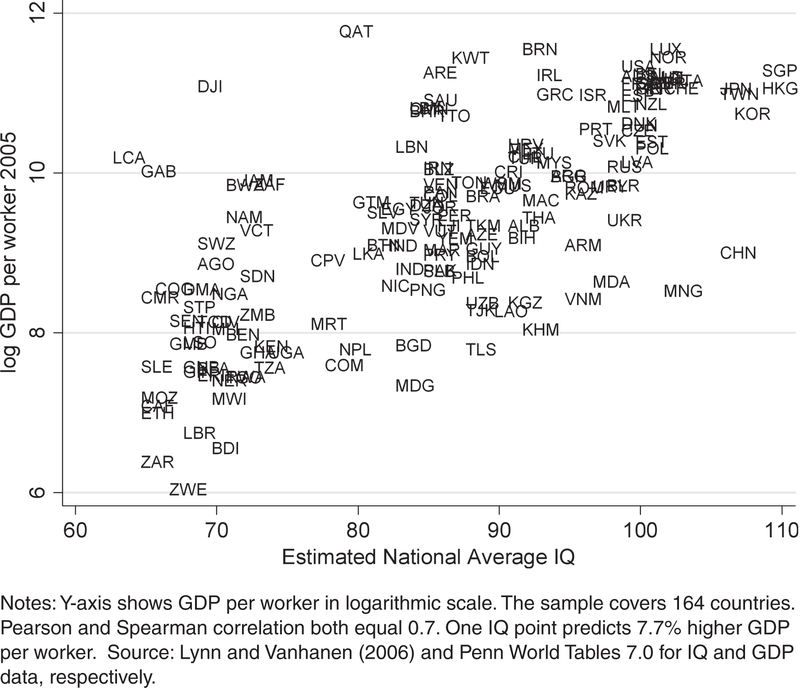 Can IQ be measured across countries, even in developing countries? And if so, do these tests have similar real-world reliability to IQ tests given within OECD countries? The answer to both questions is yes, with some modest grounds for caution…. The psychologist Richard Lynn and the political scientist Tatu Vanhanen (henceforth LV) assembled two collections of IQ scores by scouring the academic and practitioner literatures for reported IQ in a total of 113 countries (2002, 2006). They included some IQ standardisation samples and some national tests of mathematical ability, but most of the studies they used were ‘opportunity samples’, studies of an ostensibly typical classroom or school in a particular country. Unfortunately, there is very little evidence that IQ actual measures anything innate. In fact, measured IQ has been going up “substantially and consistently, all over the world” since the tests started being administered in the first half of the twentieth century. (The phenomenon is known as the Flynn effect.) Scientists “correct” for this by normalizing scores to 100, hiding from the casual observer the fact that a measured IQ of 100 nowadays would be equivalent to 130 a century ago. There’s more to say on the subject but this post is long enough already, so I will leave you with some additional reading and highly recommend Gould’s book to anyone who works in quantitative science of any kind. “Rising Scores on Intelligence Tests.” Ulric Nelsser, American Scientist.